OK – It’s August and it’s HOT. 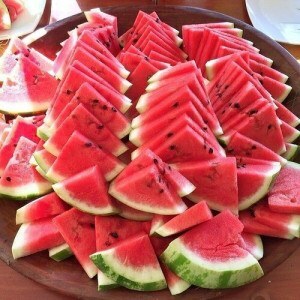 So I have a list for you what foods can cool you off, while helping your skin, too! What a “BONUS”! Here are nine, many of which might already be in your fridge. What you eat is more important than what you put on your skin a lot of times…. If you eat these, I promise, you’re going to glow. While mint is very uplifting, it’s also relaxing to the body. Whenever you’re relaxed, that’s going to help reduce your stress hormones, which in turn is kinder to your skin. Stress is a trigger for acne and for premature aging. Mint also may help reduce androgen’s, which can cause oil production and acne. Grapes are only cooling if they are sweet. Green grapes, for example, won’t do the trick. Sour, salty, and pungent foods are more heating, you want grapes that aren’t sour. These refreshing slices are way more than a facial accessory. Cucumbers are similar to watermelon in that they’re hydrating foods. I really like cucumbers because the silica in them also has anti-aging qualities. I mean, who can argue with a two-for-one? This root is super anti-inflammatory, which means it helps with flareups of all kinds over time, whether it’s an acne breakout or sore knees and joints following your long runs. I have been adding it to almost all of my “Indian” cooking. It also is know the help reduce Type 2 diabetes. (Mike suffers from this – so always looking for natural remedies for him). The summertime favorite, I call “medicine” will definitely bring your temperature down It’s not just cooling. It’s cold. I try not to eat it until summer,” abiding the Ayurvedic seasonal eating philosophy. I recommend that you don’t eat it with other foods, but instead wait to snack on it about an hour after your meal. The buzzed-about beverage got its rep for a reason – it’s very cooling, balancing, and has a lot of electrolytes, which we lose when we sweat in the summer. Coconut water is God’s gift! I love this garnish – Mike (my husband) really introduced me to it. Love it because it’s flavorful and has culinary uses, yet it’s detoxifying and cooling, which makes it your skin’s friend in summer. Many spices naturally bring ‘warmth’ to your body, but fennel brings ‘cool’ to your body. Thinly slice raw fennel over a salad and enjoy the cabbage-like crunch and better digestion, which helps promote clear and glowing skin. My husbands family passes it around the table after dinner to clean your pallet as well as aid in digestion ( apparently very Italian) – I am learning to “like” it – honestly not my favorite but this women will do ALOT for the sake of BEAUTY! Tea in the summer? It might not sound refreshing, but it’ll cool you off. The tea reduces heat—and even counteracts the heat from eating a little too much spicy foods.